Observation - Freak Hairstreak - UK and Ireland. 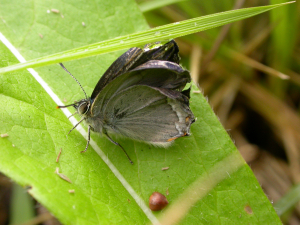 Description: This is a purple hairstreak that at first glance looked freshly emerged with wings not yet fully extended. However, it was still the same several hours later...does anyone know what might be wrong with it? This is a purple hairstreak that at first glance looked freshly emerged with wings not yet fully extended. However, it was still the same several hours later...does anyone know what might be wrong with it?